In 2011, the Asia-Pacific region represented nearly 36 percent of the world’s $5.3 billion global mobile advertising market, with mobile ad spend totaling $1.9 billion. The region’s leading position was indicated by research by the IAB Mobile Marketing Center of Excellence, IAB Europe and HIS Screen Digest. Mashable.com reported on the details of mobile advertising’s great global expansion. “As many mobile ad campaigns are played out in a global ecosystem, the market we have to size spans across borders,” said Alan Heureux, president and CEO of IAB Europe. Asia-Pacific’s dominance of the mobile ad market was followed by North America’s 31.4 percent of mobile ad spend and Europe’s 25.9 percent. Other regions were also included in the research yet they accounted for an extremely small percentage of mobile ad spending. In fact, the regions of Latin America, Africa and the Middle East only made up a combined total of 6.7 percent of dollars spent in the global mobile market. The findings were divided further to reveal that North America was the leader in the display and messaging categories with $811 million spent on mobile search, $572 million allotted to mobile display, and $295 million put toward text messaging. The research also revealed that while North America spent more than the Asia-Pacific region on display and messaging, Asia-Pacific actually spent $570 million more on search than North America and over $480 million more than Europe. 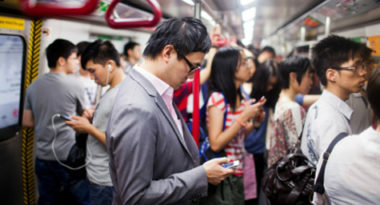 Ultimately, the Asia-Pacific region spent more than $1.38 billion on mobile advertising last year. To learn how to use mobile advertising to grow your business, contact MDG Advertising today at 561-338-7797 or visit mdgadvertising.com.